13 Reasons Why | It's no surprise that I've chosen to kick this list off with something TV-related. I have to admit that even after several recommendations from fellow book bloggers over the years I still haven't yet read the novel the latest Netflix original series is based on (I will, I promise!) but I was still intrigued by the release of 13 Reasons Why which finally hit Netflix last month. The thirteen-episode series is dark, intense and powerful and touches on some serious and incredibly important subjects. There has been a lot of controversy surrounding the show, personally I found it to be a difficult but interesting watch. 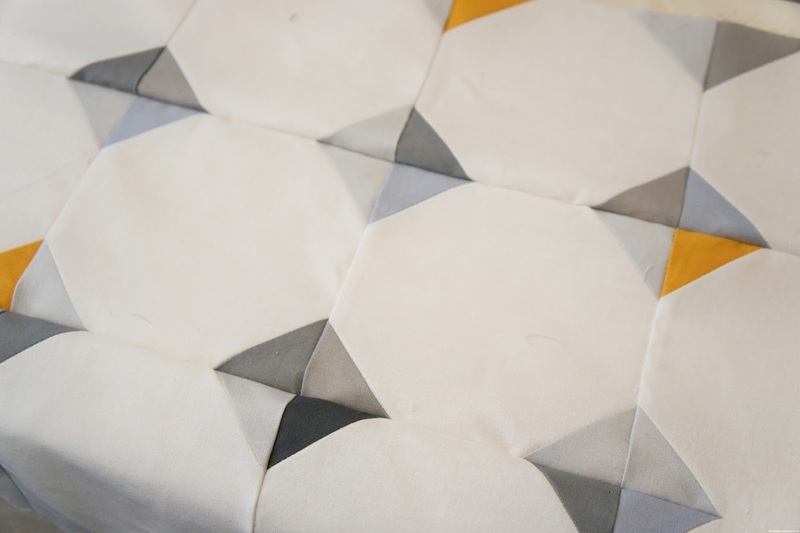 Tiny Tiles | One of my current offline detours is another quilt project (pictured above). This time around I've actually chosen to pre-purchase everything and am following a beautiful pattern from Purl Soho. As you can see, for my version I've opted to switch up the colour palette using greys and blue-ish tones with a pop of colour from a mustard yellow. At the time of writing this post I've just finished sewing together the patchwork quilt top (So. Many. Squares.) and am really happy with how it's looking so far, even if some of my diamonds don't quite match up properly! I'll be sure to share some more pictures with you once the quilt is finished. Himalayan Salt Lamp | Back in February a couple of my friends kindly bought me a birthday gift that was something I'd been keen to get my hands on for quite some time; a salt lamp! I had previously bought myself a Himalayan salt tealight holder which looks lovely but would often draw enough moisture to cause puddles. I've found the lamp to be just a pretty but much more low maintenance. I wasn't sure how bright it would be as the only lamp in the room but I've ended up using it in place of my old bedside lamp and have found it's even bright enough for reading in the evenings. Overall it's been a success all round... if I'm at home this lamp is on! NYR Night Time Aromatherapy Blend | Somewhat linked to my new favourite lamp, I've been using this Neals Yard Remedies essential oil blend both on my bedside lava bead diffuser and dropped onto some Himalayan Salt around a candle inspired by this awesome DIY from Hello Glow. This calming blend contains lavender, rose, vetiver and bergamot to encourage restful sleep and smells pretty amazing too. Found At Sea | The final little detour I wanted to include is a brand new shop full of gorgeous handmade goodies! My very good friend (and co-blogger over at Eight & Sixteen) Skye recently launched an Etsy store selling one-off pieces made with vintage fabrics sourced from around Europe. Currently on offer are some beautiful purses, pouches and storage baskets. If you're on the lookout for a unique gift or just a little treat for yourself be sure to head on over to Found At Sea! I love my Himalayan salt lamp so much, I think it adds really good vibes to the room and a really calming and relaxing light that isn't too bright or too dim. Perfect for a reading light, also 13RW!!! I agree, definitely calming and looks lovely too! I still need to read 13 Reasons Why too! It's probably the reason I haven't watched the show yet, but I've heard great things!